Although we love our pets dearly, constant attention seeking behaviour can soon become annoying and embarrassing! 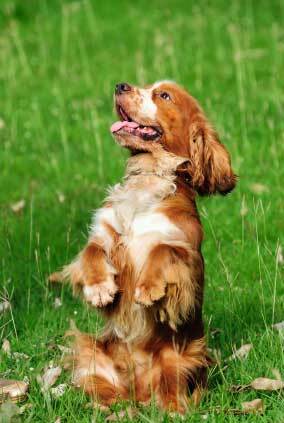 Understand the signs and causes and learn how to stop your Cocker Spaniel demanding your attention! When a puppy seeks your attention it's often cute and endearing, but when your puppy grows up and wants you all to himself, it can become a very different matter altogether. Very often we give in to our dogs attention seeking behaviour, either because we love them and can't bear to ignore them or because we sometimes just want a bit of peace and quiet...so we just give them what they want! Unfortunately, giving them what they want only teaches them that their unsociable antics work and so they do it more and more, because they know it works! What behaviour you accept from your Cocker Spaniel (or don't) is entirely down to you; it all boils down to personal choice. when he picks up a toy and circles just out of my reach, hoping I'll chase him. when I'm taking some time out to relax (reading or simply enjoying a leisurely cuppa) he'll saunter over (head slightly lowered and tail wagging) and will nudge or give me his paw. Sometimes he'll put his head on my lap and look up at me appealingly with those big, brown, liquid eyes as if to say, 'Pleeeeeease'. Unfortunately, there are other attention seeking behaviours that I'm not so happy to go along with. Take a look below, I think you'll agree with me that these behaviours are simply not acceptable. he jumps on and off the furniture and runs around in circles. That's one attention seeking behaviour I can live without! Oops! Looks like this cocker spaniel has forgotten his manners! he resorts to pooping and peeing in your home...now that definitely get's my attention! I've even heard of dogs actually vomiting for attention! Do any of these sound familiar? I'm betting that at least some of them do! In all of the above, your Cocker Spaniel is using attention seeking behaviour to get what he wants from you. Clever eh? Never try to resolve Cocker Spaniel aggression problems yourself. If your pet's attention seeking behaviour turns to biting or aggression, I strongly recommend you seek professional advice and assistance from your vet or an animal behaviourist. What Causes Attention Seeking in Dogs? 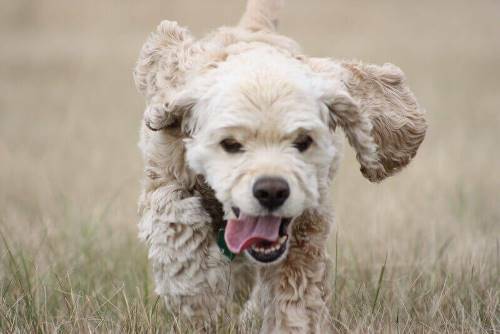 Excess energy: he may not be getting enough exercise, resulting in way too much energy. And don't forget, as well as physical exercise, dogs need mental stimulation too. Because he get's away with it: your Cocker Spaniel wants something from you and has learned that all he has to do is use one of his attention seeking antics. It's as simple as that! You can relieve the boredom, or stop it happening in the first place, by making sure you Cocker has lots of stimulating toys as well as chew bones to keep him occupied. Give Your Cocker Spaniel Lots of Exercise! 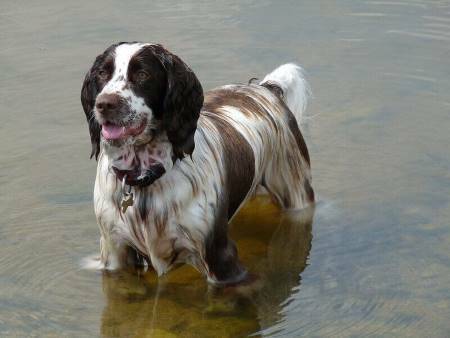 Physical exercise and mental stimulation will have a calming, relaxing effect on any dog, so the best thing you can do to help stop your Spaniel becoming bored is to burn off his excess energy and tire him out. I love running on the beach and in the sea! reinforce his basic obedience training for a few minutes each day to help stimulate his mind (and reinforce his training). It's easy enough to do and takes no time at all. For example, I ask my Cocker Spaniel to sit and wait before I feed him, before I put his collar on, and always before I open the door to let him in or out - in other words, I make Max work for what he wants and for the attention I give him! I'm sure your Cocker's diet will be healthy, but did you know that hyperactivity can sometimes be caused by certain foods in his diet? If you think your pet may be hyperactive and you're concerned about it, I recommend you have a chat with your vet. give him a job to do - work him! Satisfy his basic hunting instincts by letting him sniff out some hidden treats around the home or in the garden. Encourage him to find them and watch that tail wag! Making sure your Cocker gets plenty of exercise and play may be enough to curb attention seeking behaviours and you could see an improvement within a week or so! However, your dog may be hungry, cold, hot, thirsty, and you can't deprive him of any of these, so the best way to deal with these situations is to make sure his water bowl is always full, that he's fed at his regular meal time(s) and that he's otherwise comfortable. If he's still demanding your attention, simply grit your teeth andignore him. How To Stop Your Dog's Attention Seeking! 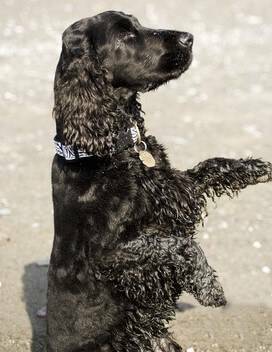 If your Cocker's manners don't improve as much as you'd like.......read on for more help and advice! Don't Give Him What He Wants! shouting at them to be quiet! All of which are the wrong thing to do, but I'm willing to bet that we're all guilty of doing the same at some point! What we often don't realize is that by using our pet's name, or speaking to him (for example, asking him to get down, or to be quiet) or by simply touching him (moving him out of the way), in his eyes we are rewarding him for his behaviour; we’re giving him the attention he's seeking! Our dogs soon learn that they can get what they want by behaving in a certain way and that's when this (unwanted) attention seeking behaviour becomes habitual...because your dog has learned that it always works! Unfortunately, if his behaviour isn't managed properly, before you know it, your dog may develop behavioural problems which you can no longer handle and which may begin to really drive you crazy! Unfortunately, there are many Cocker Spaniels currently sitting in rescue centers because of this lack of understanding. - in your dog's eyes, these actions are all forms of reward"
When our dogs display attention seeking behaviours we know that always giving them what they want, when they want, is inadvisable, however as I said earlier, it is subjective and if you think it's okay to give him a cuddle when he 'demands' it...that's fine. The aim is to give your Cocker Spaniel lots of attention on your terms; in fact, the same attention as he gets now, but give it to him only when he's good! But there are other attention seeking behaviours that we don't want and shouldn't tolerate at all, such as jumping up, constant barking or whining. If we react to our dog's behaviour, we're not only confirming that their antics work, but we may also be (inadvertently) helping to increase their dominance by following and not leading our dog! My advice is to always ignore your dog's attention seeking behaviour and reward him only when he's well behaved, or when he's quiet. It's Ironic that we tend to ignore our dogs when they're quiet, and (unwittingly) reward them (with touch and the sound of our voice) when they're not - the exact opposite of what we should be doing! So, the next time you see your Cocker Spaniel behaving well, or resting quietly, why not go over to him and stroke him gently and tell him he's a good boy? Rewarding your dog when he's quiet will help teach him that when he's good or quiet, nice things happen to him, like belly rubs or cuddles! The worst punishment you can give an attention seeking dog is to deprive him of your attention and affection, so the next time he's making demands the best thing you can do is ignore him. Yes, I know that it can be easier said than done, but trust me. Have patience and you'll see that it really does work. Don't react to your dog's demands. Whatever his behaviour, remain calm, don't speak to him, don't touch him, and don't make eye contact (your dog views all these as forms of reward). Is Your Dog Is Barking For Attention? I just love to run...! So, for example, if your dog is barking for your attention, ignore him and continue with what you were doing (unpacking the shopping or reading). Ignoring him probably won't work the first time round - let's face it, our dogs can be very persistent!) so if he persists, or becomes boisterous, take him into another room and leave him until he's calmed down. Don't show annoyance or anger, just be in control and remain calm and unemotional. Don't allow him back into the room until he's quiet for at least 10 seconds (the trick is to wait for a lull in the barking and only let him into the room when he's stopped) otherwise he'll learn that barking for attention eventually works! Make eye contact with him and put him into the submissive 'Down-Stay' position for a few seconds before letting him back into the room. If he starts barking again...rinse and repeat. Above all, be consistent! If moving him to another room fails, and he continues barking, you may want to consider using a stronger barking deterrent, such as a water pistol or an air spray (this is compressed air used to clean computer keyboards and cameras). Be careful to avoid his eyes. Either of these may be used each time he uses barking to get your attention. The action will startle him into silence, interrupting his behaviour and you should be able to manage him. If you'd like more information on how to stop your dog barking, you'll find lots of help and advice here. Reinforce your dog's good behaviour by rewarding him for it and never reward his attention seeking behaviour. The bottom line is, if your dog wants attention, give it to him, but do so on your terms - not his! 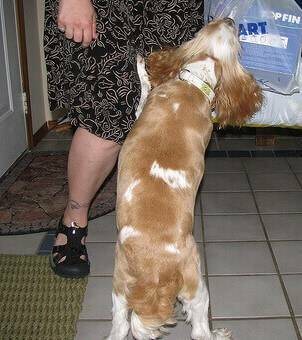 When your Cocker Spaniel responds in the way that you want him to, you can give him what he was asking for (food, affection, etc.) because you will be rewarding him for following your commands; you're rewarding his good behaviour NOT his attention seeking behaviour!